Created with the intention of showcasing the young talents of the Basque Architecture and summoned by the Peña Ganchegui Archive in collaboration with the Basque Government's Department of Housing and Architecture, the Peña Ganchegui Prize receives its name after the most outstanding Basque architect of the second half of the 20th century. Established in San Sebastián after his training in Madrid, Luis Peña Ganchegui (Oñati 1926 - San Sebastián 2009) enjoyed a great recognition since his first work: Torre Vista Alegre (Zarautz, 1959), which was reaffirmed with the construction of the Plaza de la Trinidad (San Sebastián 1963) during his short time as a municipal architect. Pioneering project of conditioning as a public area an urban empty space inside the old quarter, the Plaza de la Trinidad highlighted the special sensitivity of Peña Ganchegui to the context and his enormous capacity for dialogue with what already exists. His mastery as Architect of the Place consolidated over the years, displaying a wide range of solutions in the most varied situations. An extensive and rigorous work, composed mainly by groups of flats, public facilities and buildings for industry, which defines as no other the principles required to adapt modern architecture to the urban and rural features of the Basque Country. But if there is a work that enshrines him as master of landscape architecture, that is without any doubt the Tennis Plaza (San Sebastián, 1976). A perfect symbiosis between nature, art and architecture, the anteroom of the sculptural group Peine del Viento by Eduardo Chillida, is one of the most representative spaces of the capital of Gipuzkoa and the most celebrated work of the Basque architect. 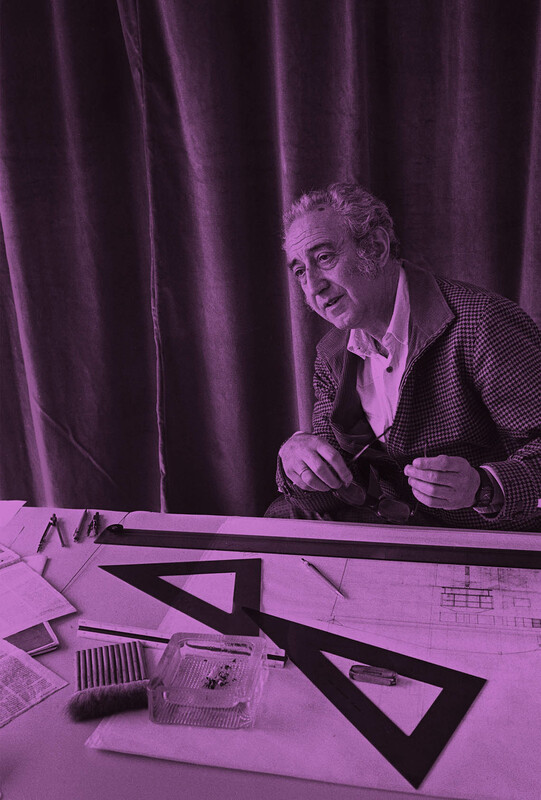 Founder of the School of Architecture of the Basque Country, he at all times combined his professional activity at the helm of his study with other parallel activities linked to the world of teaching and architectural culture. Among the awards and acknowledgments received by Luis Peña Ganchegui all through his career it would be worth to cite the Munibe Prize, awarded by the Basque Government in 1997; the Antonio Camuñas Prize, awarded by the Camuñas Foundation in 1999; and the Gold Medal of Spanish Architecture, granted in 2004 by the Superior Council of Colleges of Architects of Spain.